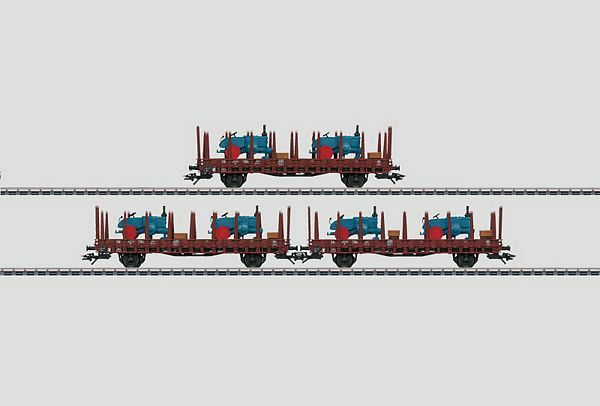 Prototype: 3 German Federal Railroad (DB) type Rr 20 two-axle stake cars, interchange design. Version with stamped metal stakes, without a hand brake. All of the cars could be re-gauged for Russian wide gauge track. The cars look as they did in the Fifties. Model: All of the cars have truss rods and each car comes loaded with parts for Lanz tractors. The parts are in load frames. All of the cars have different car numbers. Stakes that can be installed on the cars are included. Total length over the buffers 41.9 cm / 16-1/2. DC wheel set for each car 2 x 700580. New tooling for the interchange design of the type Rr 20 stake car. Version with stamped metal stakes.